Ill or infected food workers are frequently the cause of many foodborne illnesses, often by touching ready-to-eat foods (salad, fruit, deli sandwiches, ice, and cooked foods) with their bare hands before serving, or by contaminating surfaces and utensils that come in contact with food. Excluding or restricting ill or infected employees from working with food is one of the critical factors to preventing foodborne illness from occurring in your facility. Other critical factors to prevent foodborne illness are proper handwashing and eliminating bare hand contact with ready-to-eat foods. Employees are informed of the Employee Health Policy. 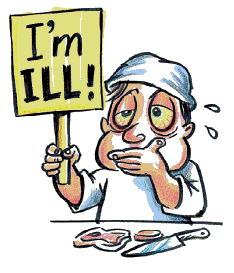 Employees recognize symptoms associated with illnesses that can be transmitted from the food handler to food. Employees know their responsibility to report to the Person In Charge (PIC) about their health and activities as they relate to diseases that are transmissible through food. The Person In Charge (PIC) takes appropriate action to exclude, restrict and/or monitor ill or symptomatic employees.